This post is going to take a quick look a the guitars in the Taylor 500 series. I will take a look at the specs and the differences between each guitar in the series. Naturally, each guitar will have a lot of similarities, being part of the same series, but each guitar is different in some way. The 500 series offers a good number of options, so if you think this is the kind of guitar you are after and is within your price range, then you should be able to find an option to suit you. For quick reference, the following is what each number and letter signifies in the names. The 2nd number signifies the type of the guitar and the top wood used “1” is for a six string guitar with either a spruce or cedar top. “2” is for mahogany topped six strings. “5” is for spruce or cedar topped 12 string and “6” is for Mahogany topped 12 string. The 3rd number signifies the shape of the guitar. “0” stands for Dreadnought. “4” stands for Grand Auditorium. “2” stands for Grand Concert. “6” stands for Grand Symphony and “8” stands for Grand Orchestra. O.k. let’s check out each guitar and what makes it different to the other guitars in the line. Starting with the first of the dreadnought models, we have the 510e. Featuring solid mahogany back and sides, the main factor that is the same with all the guitars in this series, the guitars in this line are naturally warm sounding and have more emphasis on the mid-range. This is more or less so, depending on the top that they are paired with. This guitar and others in this series, also feature a slightly shortened 24 7/8” (632mm) scale length – this allows for less string tension, which makes this guitar easier on the fingers and easier to perform techniques such as bends. A couple of smaller differences are that the 512ce has a solid headstock whereas the 510e has a slotted headstock and that the 512ce is set up for light gauge strings and the 510e is setup for medium gauge strings. The 512ce 12-Fret is naturally the same as the 512ce with the major difference being that the neck joins the body at the 12th fret instead of the 14th fret. It also has 18 frets overall compared with the 512ce’s 20 frets. The 512ce 12-Fret features a slotted headstock. Being a 12-Fret it will have a looser string feel to it, and with that slightly shortened scale length making it already reduced, tension-wise, it will have a very easy going feel to it and will make this guitar very easy to get expressive on – making things like bends and vibratos very easy to achieve. Moving onto the Grand Auditorium model. Has a 25 ½” (648mm) scale length as opposed to the 24 7/8” (632mm) on the Grand Concert and Dreadnought models. This guitar is more similar to the 510e than it is to the 512ce or 514ce, in that it features a Lutz Spruce top as opposed to the Cedar tops on the 512ce and 514ce and has a larger body. The 516ce has Tayor’s Grand Symphony shape/size, which is the main difference between this and the 510e. This is a large bodied guitar that has a volume ceiling that is high, like on the Dreadnought but is also more responsive to the touch than the dreadnought. The 516ce features a Florentine cutaway as opposed to the Venetian cutaway featured on the 512ce and 514ce. It also has the 25 1/2” (648mm) scale length as per the 514ce. The 520e features a Tropical Mahogany top in place of the Lutz Spruce top on the 510e. This allows for a very mid-range heavy, warm and woody sound. Apart from a small difference in the stain/sunburst used, this is otherwise identical to the 510e – but that Tropical Mahogany top will make a significant difference to the tone. Like the 520e, the 522ce features a Tropical Mahogany top but it’s other features are more like the 512ce, being a Grand Concert and featuring a Venetian Cutaway. As you can probably guess, this is the 12-Fret version of the 522ce. See the notes on the 512ce 12-Fret for more on what difference this will make. This is of course the same as the 522ce except without the cutaway. If you prefer not to have a cutaway, this is the option for you – and you save a few dollars as well. This is the Grand Symphony model of the 522ce. There are also some aesthetic differences. 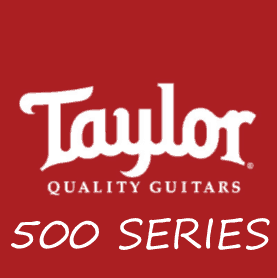 The 552ce is the first of two 12 string models to feature in Taylor’s 500 series. The 552ce is the Cedar topped option. It has a Grand Concert shape. That it’s a 12 string! The 562ce is the Mahogany topped 12-string in the 500 series. This is virtually a carbon copy of the 552ce, with the one major difference being the Mahogany top in place of the Cedar top on the 552ce. So, there you have a brief overview of the guitars in Taylor’s 500 series. Have you played any of these guitars? What did you think of the guitar(s) in this series that you played? Feel free to leave a comment in the comments section below.